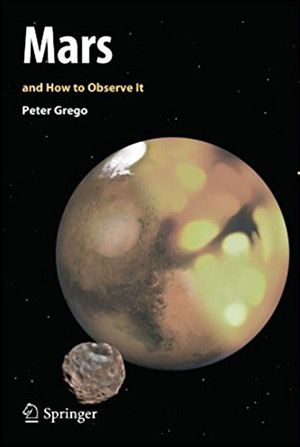 This book, by amateur astronomer Peter Grego, is half reference work and half “how to” guide for other astronomers on observing our Red Planet neighbor. The first half of the book is a treasure trove of information with a compilation of facts about Mars that would be difficult to find in one place anywhere else. 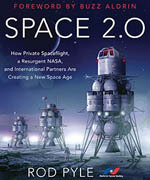 Profusely illustrated with photos from orbit and rovers on the ground, as well as with drawings and charts, the author describes Mars’ physical characteristics such as its size, mass, density and gravity, as well as the specifics of its orbit around the Sun and its axial tilt and rotation. He gives a brief history of the planet and then gives in-depth coverage of the Mars of today, including winds, water, icecaps, and geological features such as impact craters, volcanos, and rift valleys. Significant coverage is given to the atmosphere of Mars, as well as temperature, pressure, and winds at the surface. Meteors are discussed, both those found by rovers on Mars’ surface, and those chunks of Mars that were blasted off of its surface and eventually landed on Earth. Mars’ two moons, Phobos and Deimos are covered, followed by a topographic survey of all the major surface features of the planet. 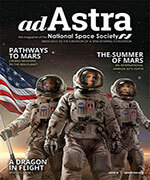 For the dedicated Mars observer, this survey is worth the price of the book all by itself. In addition to describing well over a hundred features and illustrating the most significant, Grego provides coordinates and sizes of each so that the observer can find them easily. The second half of the book is the ‘How to Observe it’ part of the title. It goes into great detail about apparitions and oppositions. Apparitions are those times when Mars is easily visible to the naked eye. Oppositions are those times when Mars is opposite from the Sun in the sky. At opposition, the Sun, Earth, and Mars are lined up in a straight line. As a result, this is the closest that Mars comes to Earth on any given circuit around the Sun. Mars has an eccentric orbit, so some oppositions bring it closer to Earth than others. The opposition in 2003 for example, was particularly close. It was close enough for me to buy a telescope and use it to look for features on the disk of Mars. The author gives a 360-degree tour of Mars, supplemented by drawings he has made, based on his own observations during multiple apparitions. To me, these fuzzy drawings are more valuable than the crystal clear photos from orbiting spacecraft and the Hubble space telescope, because they give you a good idea of what you are likely to see through your own telescope. Grego describes how to record your observations with pencil sketches as well as cyber-sketching with a tablet computer. In many cases, the drawing you make will be superior to a photo taken through the same telescope at the same time, because the photo records only what is sees in an instant of time, whereas the combination of your eye and your brain over an interval of time that encompasses variations in seeing conditions may be able to record a truer representation. The value of taking notes on seeing conditions and other pertinent data is emphasized. Filters and photography, both film and digital are discussed, including video, and even the use of Webcams. There is also a section on digital imaging by famous Pluto “killer” Mike Brown, the discoverer of Eris and many other Kuiper Belt objects. Perhaps the most immediately practical part of the book for Mars observers is the “Observer’s Guide to Martian Apparitions 2012-2022.” This describes the best times to observe Mars, and what you can expect to see in terms of size, brightness, and location in the sky. The book wraps up with a description of equipment used for Mars observation, starting with naked eye observation, moving through binoculars to the various types of telescopes used by amateurs. Overall, Mars and How to Observe It is a valuable resource for anyone interested in observing Mars.